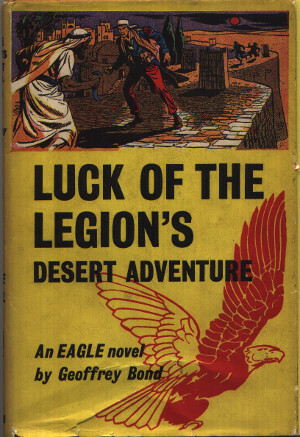 Luck of the Legion's Desert Adventure. A ruler who has always been a friend to the Legion suddenly changes and sends fighting hoards across the desert. How can a boy, a silversmith, a crimson robed figure and a beetle help the three legionnaires, Luck, Trenet and Bimberg, find the cause and bring peace to the desert again? Dimensions : 13.5cm x 20cm with 176 pages. "As for failure - there's no such thing. Has the Legion ever failed yet? Bimberg looked over his shoulder nervously. "Don't talk about screams," he shuddered. "The only sort I like are ice-creams!" "That's a fine way to go! Bodging me on the bonce - and then saying there's no ill-feeling"
"Ishkabibble! It gave me the heebie-jeebies!" stammered Bimberg, mopping a damp forehead. "I was more ready for a hearse than a horse!" "Pah!" muttered Legionnaire 12345. "I am a wonderful mathematician. Almost a ready reckoner, one might say!" "Stones and sticks may play their tricks but if we don't find the treasure this ain't my idea of pleasure!" "There's probably a mummy underneath, and it might not like to be disturbed. I know my mummy wouldn't!" "By Jupiter!" exclaimed Sergeant Luck. "We did the right thing after all - and it was your idea, Bimberg!"